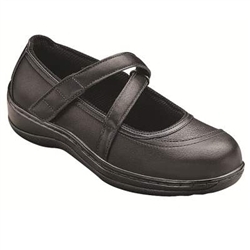 Unsurpassed Comfort In Orthofeet Mary Jane Orthotic Shoes. Unique orthotic support, seamless lining, extra room and Ergonomic Stride sole offer unsurpassed comfort and relief for heel-pain, arch-pain and forefoot discomfort along with extra protection for sensitive feet such as diabetic or arthritic feet. Non-binding construction along with padded collar and extra foam padding of entire upper make every step you take soothing with comfort.